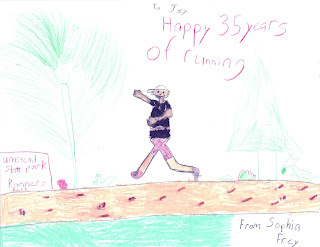 runjoey: 35 years and still loving it ! 35 years and still loving it ! Today marks the last day of my 35th year of running and tomorrow on June 7th I''ll begin with year 36. To celebrate this milestone I organized a run in cooperation with Capital RunWalk on a course that would include the 3 mile loop that I used to run on when it all began back in 1977. The store where I have been happily employed part-time for nearly 5 years now is just about 1/2 mile away from that loop so it was very convenient to use as a staging area. It turned out to be a beautiful evening for it with temps in the mid-70's and moderate humidity. I was joined on this tour down memory lane by about 20 friends including all 4 of my most frequent Angels and training partners for an easy paced run. A few others including The Labella sisters and kids came by to wish me well but didn't run. I mostly led the way until about the 2 mile point where we came by the house that I was living in at that time. We had a humorous moment there. There was a lady with a baby sitting in the front yard and I stopped and was telling her that I used to live in the basement of her house and that was why we were running by. Just as I started to run ahead her husband stepped out and said he would love to hear the story sometime because he had heard people used to live in the basement. He had a heavy accent which I would guess was Eastern European and I then realized why his wife was looking at me so strangely. I don't think she understood a word I was saying and just thought some weirdo was pointing at her house and yakking about something. So anyway after everyone had gone by the house I took off at tempo pace to try and catch back up to the front of the group making sure to speak to everyone as I ran by. Once we returned to the store I did a little show and tell with my first real pair of running shoes which I got for Christmas in 1977, a pair of Nike waffle Trainers. I also had some bibs and race info from several of my first races in 1978 and a couple of t-shirts including the one I wore from the 1st Great Raleigh Road Race of June 1978. Among the archives were newsletters form 1978 for the North Carolina Track Club, The 1981 North Carolina Roadrunners Club and 1982 Cary Express Track Club. I even brought out the plaque and newspaper article from the one and only race I ever won, the 1987 Featherfest Turkey Trot 5k in Goldsboro. After the show and tell we shared a toast with some sparkling juice followed by some delicious cake and Yoohoo's ! Woohooo ! 5 years ago, before I was working at the store and before Facebook made it so easy to connect I celebrated 30 years with a run from Pullen Park which is on the loop with my very dear friends Karla, Jenn and Jerry. Here is a link to the post from that run which includes a little more of the history of how it started. I'll not repeat it over in this post. I would like to say how thankful I am to still be able to run as well as I am now at 56 years of age after so many years. A lot of life happens in 35 years as you can imagine and many of you can relate so it really seems a miracle in so many ways that I have been fortunate enough to stay healthy over all these many years. And what is really amazing is that over half of my lifetime total of over 39,000 miles has occurred in the past 10 years. And after all that time and all those miles I am enjoying it as much and feel as passionate about running now more than ever. Here is another link with a bit more history. Thanks to Mike Zimmerman and Jon Baker for hosting this run and the cake and refreshments. And a big thanks to all that came out to support me and the many many friends and family that couldn't be there but had us in their thoughts. Joey, it was a lot of fun running with you this past Tuesday evening while celebrating those 35 years with you. I'm still amazed that you have held onto all the memorabilia this long! 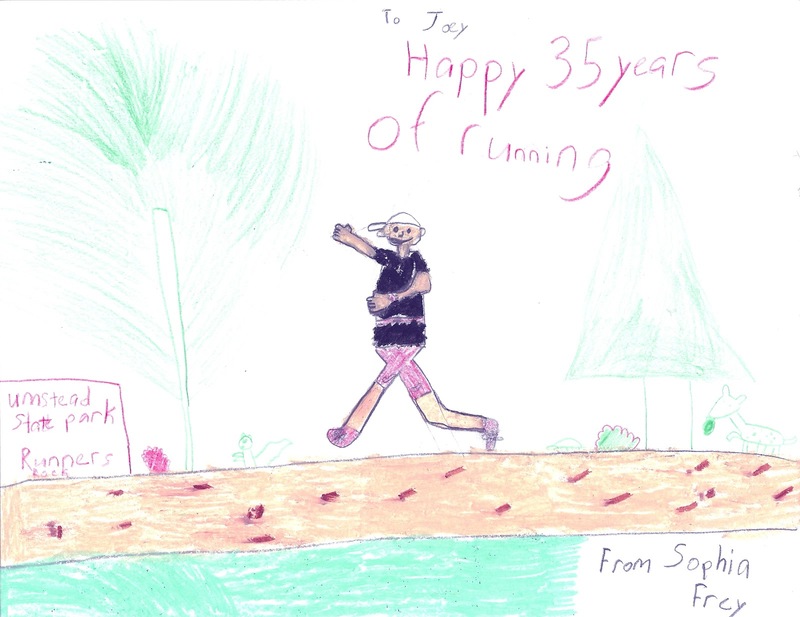 Thanks for including all of us and continuing to inspire so many of us to keep running. thanks Ronnie. Glad you could join me for the run. I've got a huge box full of old race and club stuff from the late 70's and 80's plus stacks of old magazines too.